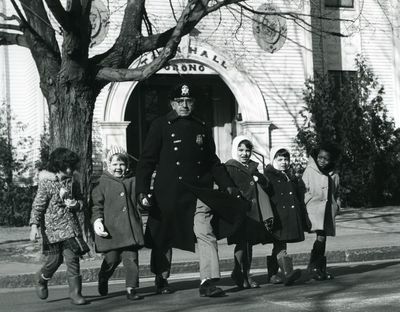 A black and white photograph of a uniformed crossing guard walking five children across the street taken by Jim Garvin, official photographer for the University of Maine in the 1950s and 1960s. Garvin was hired to take photographs for the annual Orono Town Report. A building in the background is labeled Town Hall, Orono. Handwriting on the back of the photograph appears to say "Officer Petite and kids, Orono, 1964."